“Come one Come All” Cancel those Dinner Reservations and mark your calenders now so you can join us for are annual pin trading event held on Friday, September 7th from 7-10pm at the Port Orleans Riverside Foodcourt!! We hope that MANY of you will be able to join us for this unique trading opportunity, plan on meeting new friends and enjoying a friendly evening of Disney Pin Trading!!!! 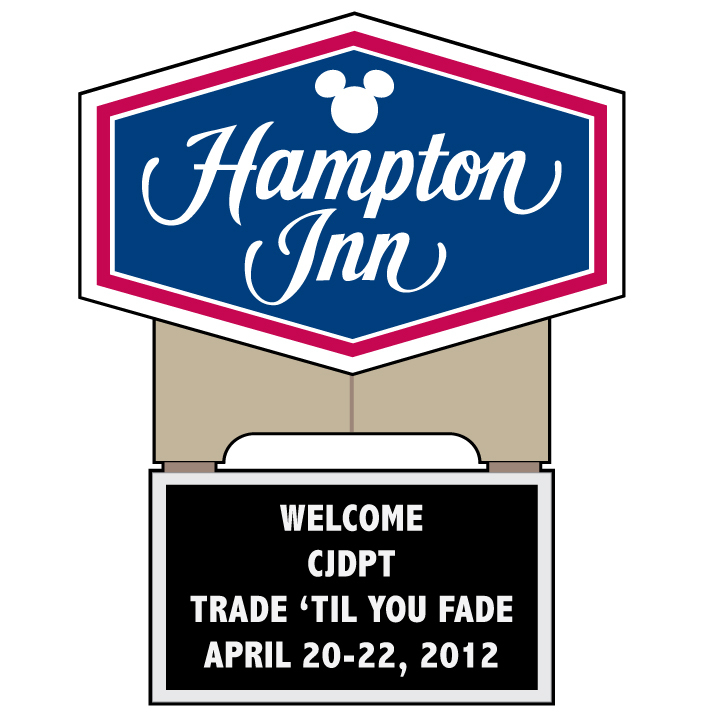 Any questions please contact me at: john@cjdpt.com I hope to see you there…. Here is a sneak peek at the artwork for our event pin for this coming weekend!!! Hope you like it……We do!!!! Well as promised this week Disney released the details of this year’s Pin/Vinylmation Celebration at Epcot in September!!! ***The most notable feature being the Vinylmation Showcase running until 5:30pm on Sunday the 9th of September!! Which means for the first time there will be no public day on Sunday. September 7 – 8, 2012 – 9:30 a.m. to 6:00 p.m.Come one, come all to participate under the Big Top at Mickey’s Circus! Guests are invited to clown around and enjoy the sights, sounds laughs and thrills at Mickey’s Circus Pin Trading Showcase from September 7 & 8, 2012 in World Showplace at Epcot®. Event admission is $120 per Guest. (Event admission does not include Theme Park admission to Epcot® but is required to attend. Two (2) $15 Gift Cards redeemable at Epcot® Food and Beverage locations. The first 750 Guests who register for this event will receive a limited edition early registration pin. Guests that register for this event by June 19, 2012 will receive an early booking discount. The early booking admission for this event will be $105.00 per Guest. After June 19, 2012, the event admission will be $120.00 per Guest. Event admission does not include Theme Park admission Epcot®. Start your trading day off by attending Mickey’s Circus Opening Acts Breakfast on Friday, September 7, 2012 from 8:00 a.m. to 9:30 a.m. Exclusive trading time inside Mickey’s Circus from 8:00 a.m. to 9:30 a.m.
Delectable array of desserts with coffee and tea. Exclusive trading time inside Mickey’s Circus from 7:00 p.m. to 8:30 p.m.
Special viewing area for Illuminations: Reflections of Earth at 9:00 p.m. Exclusive Mickey’s Circus Big Top Dessert Reception pinIn order to register for Mickey’s Circus Opening Acts Breakfast or Mickey’s Circus Big Top Dessert Reception, Guests must also be registered for Mickey’s Circus – Pin Trading Showcase. Mickey’s Circus Opening Acts Breakfast and Mickey’s Circus Big Top Dessert Reception are not available to Guests who only register for the Vinylmation” Showcase event. Mickey’s Circus – VinylmationTM ShowcaseEpcot® – World ShowPlaceSeptember 09, 2012 – 9:30 a.m. to 5:30 p.m.
Join us on Sunday, September 09, 2012 as we celebrate the fun and thrills of Mickey’s Circus – VinylmationTM Showcase. This Big Top celebration will take place in World ShowPlace at Epcot® from 9:30 a.m. to 5:30 p.m.
Plus extra special surprises throughout the event.Event Registration begins on “World Circus Day,” Saturday, May 19, 2012 at 12:00 p.m. (EST)Guests do not have to register for Mickey’s Circus Pin Trading Showcase in order to attend the VinylmationTM Showcase on Sunday, September 09, 2012. This is a separate ticketed event from 9:30 a.m. to 5:30 p.m.
You are currently browsing the The Central Jersey Disney Pin Traders blog archives for April, 2012.